Moms find that mobile apps make it child’s play to keep track of their children’s health information, schedules, personal needs, photos, and more. Handheld digital devices have literally put their children’s lives into their hands, making it much easier to do more for their kids and fit more into their days. According to new research from BabyCenter, these mobile-minded moms are the latest target of healthcare brands who are striving to develop mobile apps to give busy moms more ways to track their kids’ care with convenience. eMarketer.com featured more on how moms are developing healthy relationships with their mobile devices. Moms have traditionally been the main decision makers when it comes to the family’s care, so they have long been the targets of healthcare marketing. This trend toward tracking the family’s health via mobile shows no signs of slowing, so healthcare brands need to get moving to create mobile apps that will appeal to moms. Around 30% of U.S. mothers who used smartphones reported tracking their child’s development, as well as their own health and fitness progress, on their mobile devices this year. 23% kept track of their child’s nutrition on their smartphones. 62% of mothers have researched over-the-counter medications online with their mobile devices. More than half of moms have read product reviews and recommendations. At least 40% of mothers would be inclined to track their family’s health issues if they felt it was easy to do. Moms are clearly embracing mobile to record and review their family’s health progress, but they expect their tech to be simple to use and meet their needs with ease. This presents infinite opportunities for healthcare brands and app developers to create fast and friendly ways for moms to do more with their mobile phones to let them do more for their family’s health. 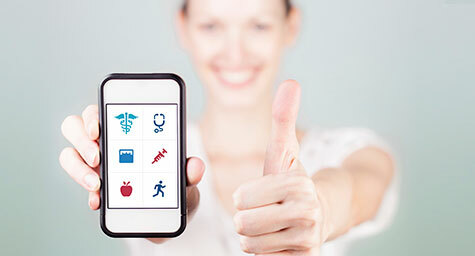 Treat yourself to the latest mobile healthcare marketing news. Contact MDG Advertising.